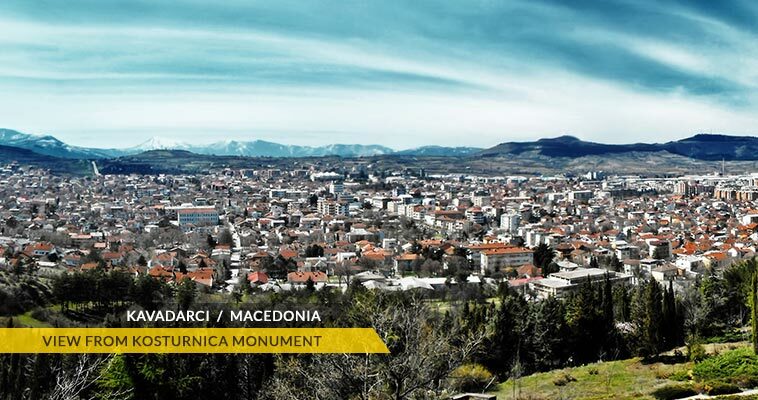 The largest town in the Tikves region, Kavadarci is located in the south-central part of Macedonia. Situated in the heart of largest Macedonian wine region, it is home to the Macedonia's largest manmade lake and the largest winery in south-eastern Europe, both named Tikves. Kavadarci is seat of the Kavadarci municipality. According to the 2002 census, Kavadarci had a population of around 29,188. Kavadarci lies at an altitude of 150 meters above the sea level. The E-75 road is passing near the town and connects Kavadarci with Skopje (105 km) on the north, with Veles (52 km) and nearby Negotino (10 km) on the east. Kavadarci is well known and famous by its wineyards and wine production, all over Macedonia as well in Greece, former Yugoslavia and other European countries, where the Tikves wines are being exported. Kavadarci is main source for wine production all over Macedonia. Traditionally, every year in September, as being largest settlement in the wine disctict a wine carnival - Tikveski Grozdober is being held.